A few years ago our friends Bryan and Karen treated us to a Food & Wine event featuring several well-known and up-and-coming chefs. Michael Psilakis, known for his classic and creative Greek dishes, was one of the presenters, and I was thrilled when he announced we were all going to receive his cookbook “How To Roast a Lamb.” On a warm summer evening just a few weeks ago I got the itch to go “Greek” so out came the Psilakis book. Here’s what was cookin’ in my kitchen. First step is to get your fire go ing (this can be said of many things in life!). 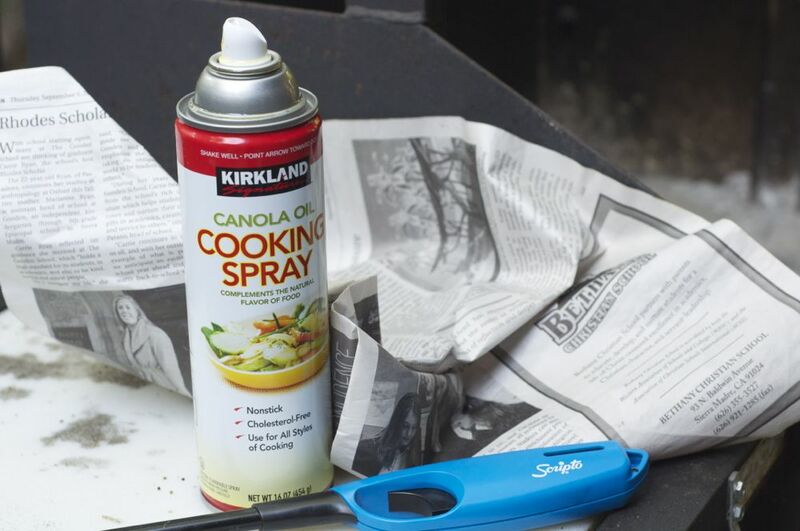 Here’s my trick .. scrunch up a few pieces of newspaper then spray with cooking spray, place under your chimney charcoal lighter, fill the chimney with briquettes, and light. The small amount of oil will keep the fire going. 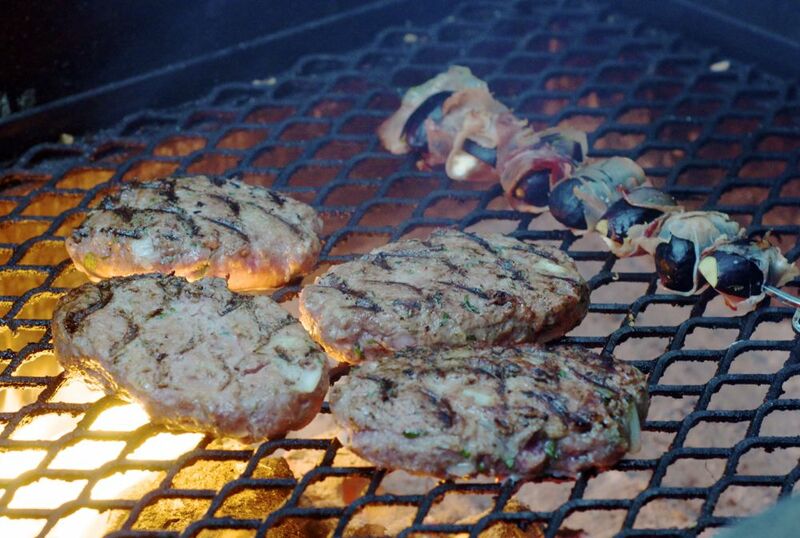 When your briquettes are starting to char on the edges, it’s time to dump ‘em into your grill. 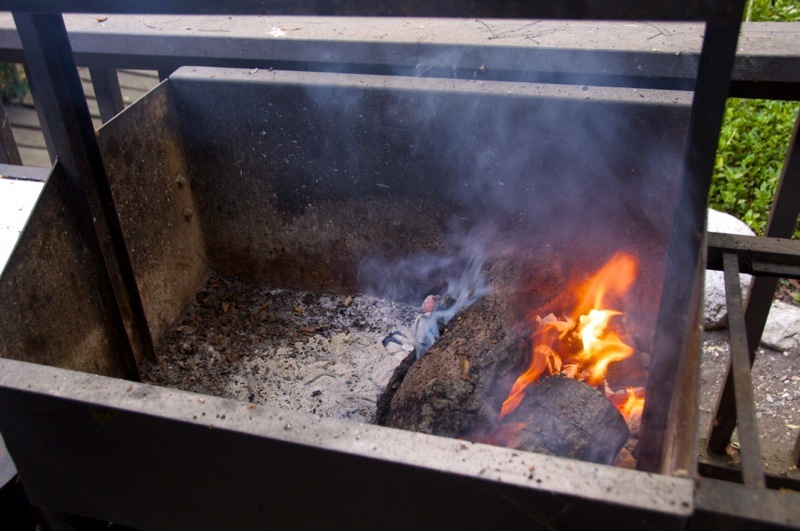 When the coals are nice and hot, throw a piece of oak into the fire – the oak burns long and hot. This is so much fun to make in a fire! 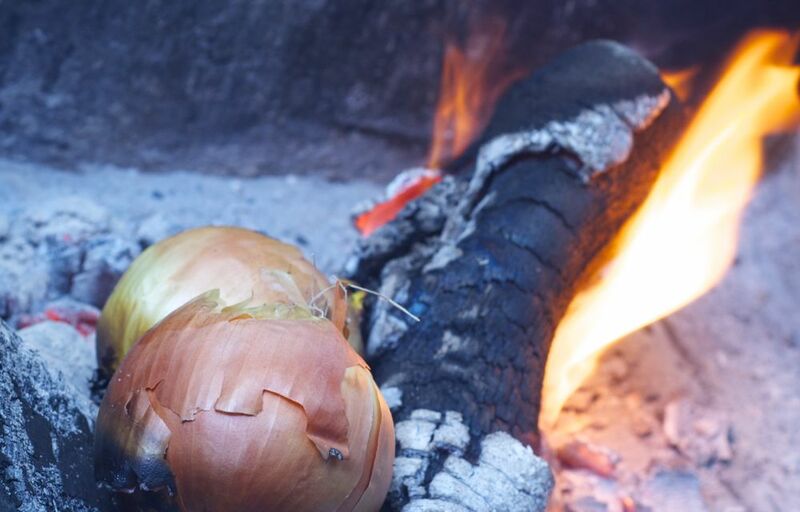 Toss the onions and eggplants right into your coals, and char ‘em in the fire. It’s important to keep turning and rotating them so they roast evenly. The eggplants will take about 20 minutes to get nice and soft, onions at least 30-40 minutes. When they’re done, remove from the fire and place in a colander over another bowl (or in the si nk). Don’t skip this step – really improves the consistency of the dip. 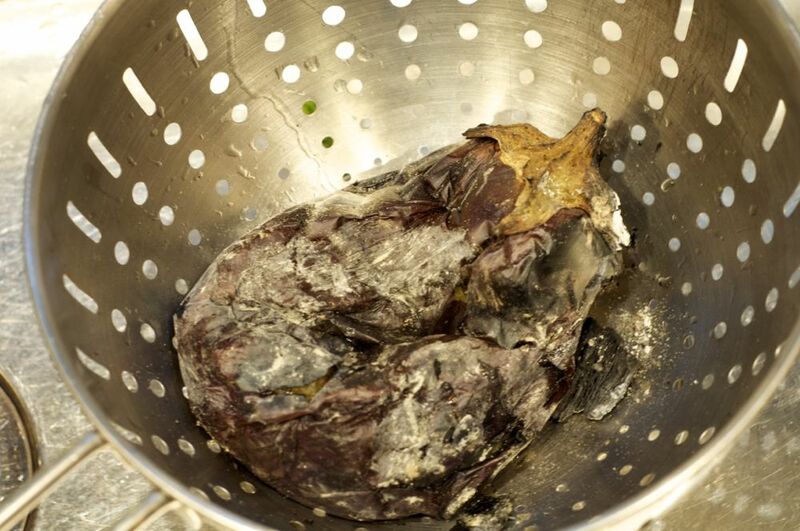 Once the eggplants and onions are cool enough to touch, carefully peel the charred skin off (my friend Deborah suggested leaving a bit of the char so I tried it – definitely added more smoky flavor!). 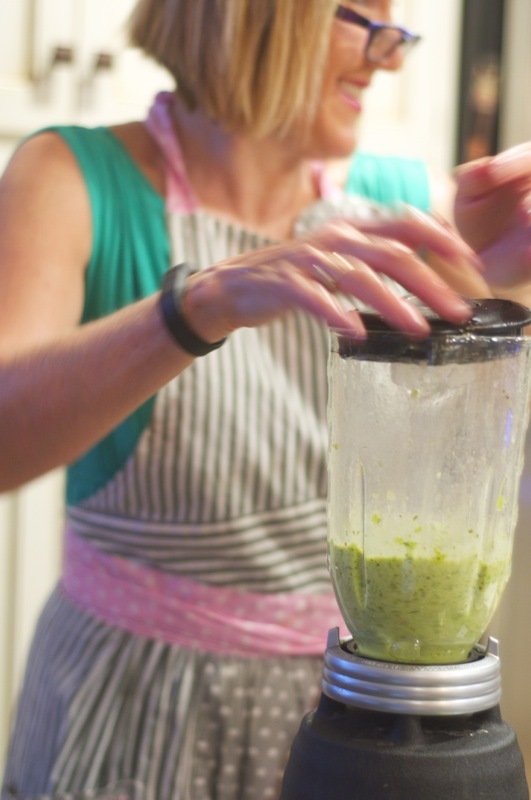 Put in your food processor and pulse with the lemon juice, tahini, parsley, salt & pepper. Whisk together and taste for seasoning. Feel free to add more lemon juice, more salt and pepper .. it will vary depending on your eggplant. Pour milk into small bowl, add bread cubes and mash with a spoon. 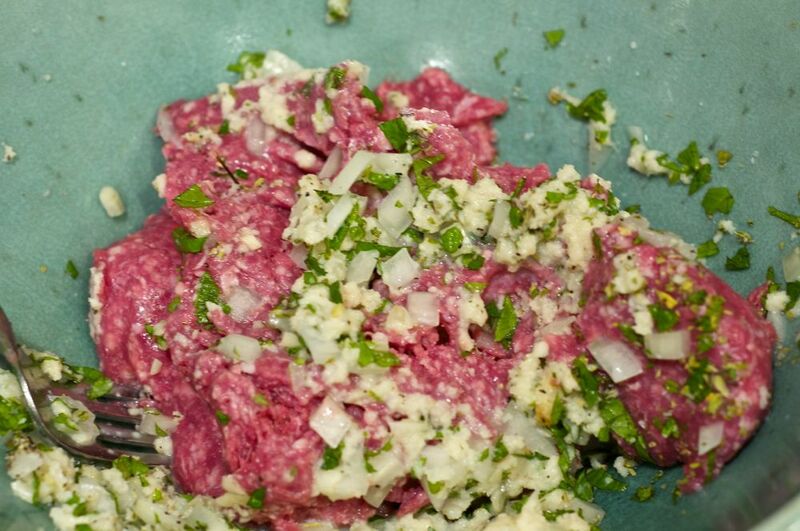 Mix lamb, milk/bread mixture, diced onions, fresh herbs and salt & pepper together with your hands. Do not overmix. Shape into patties (I form them to fit perfectly into a half pita) then press your thumb into the center to prevent burgers fro m puffing up on the grill. 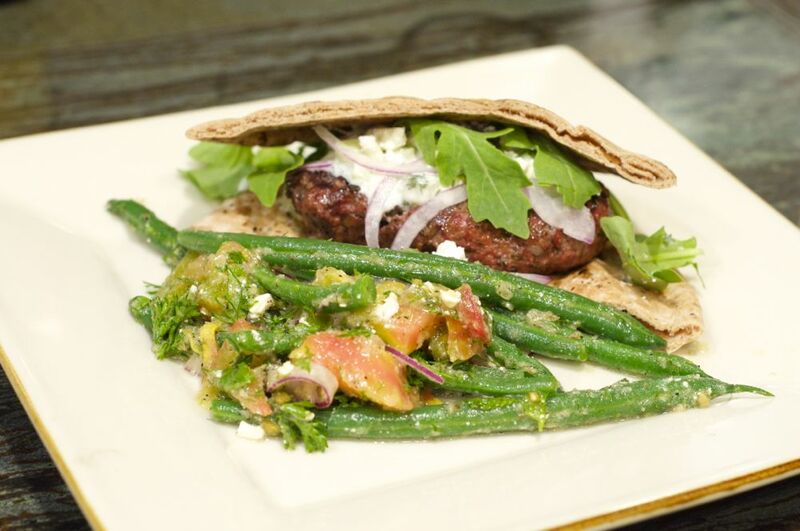 Grill burgers over a wood fire, then tuck into a pita and top with tsaziki sauce, thinly sliced red onions and arugula. 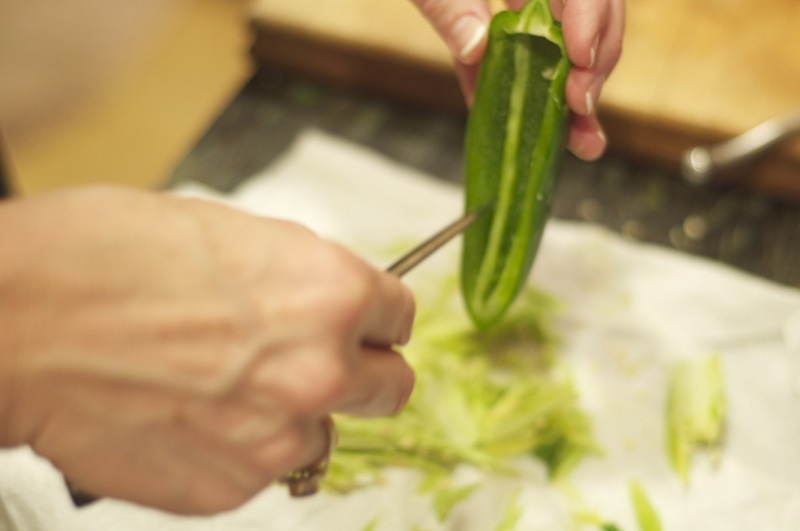 Quarter the cucumber lengthwise and trim off the triangular wedge of seeds. Cut the cucumber into a very small, even dice. Transfer to a mixing bowl. In a food processor, combine the garlic, vinegar, shallots and dill. Pulse until finely chopped but not pureed. Add the mixture to the cucumbers; add the yogurt. Fold together with a rubber spatula, adding the olive oil and lemon juice. Season liberally with kosher salt and pepper, starting off with 1 tablespoon salt. Taste for seasoning. You can store Tsatziki in a covered, clean jar in the refrigerator for up to 1 week. This is one of my favorite salads .. so very fresh and tons of flavor. Prepare an ice bath and bring a pot of salted water to a boil. 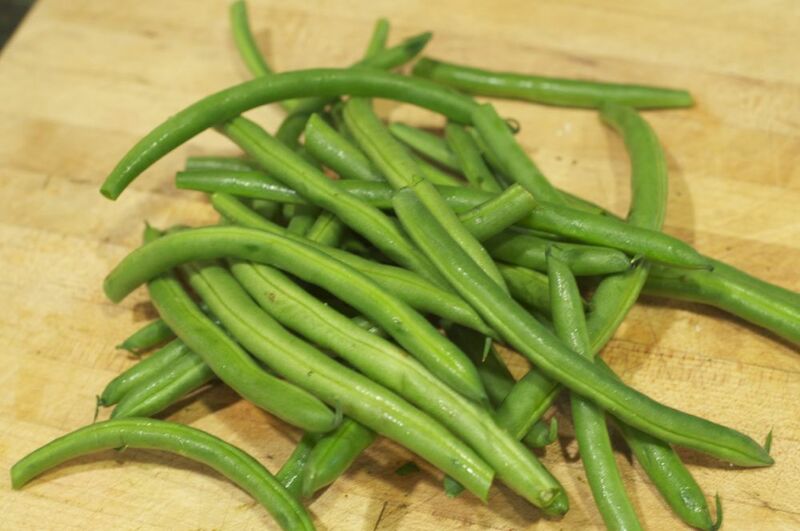 Blanch the beans until tender but still snappy, about 3 minutes, then shock them in the ice bath. Drain well and dry on a clean towel. In a bowl combine the beans, vinaigrette, feta, tomatoes, oregano, red onion, and torn herbs. Toss well with clean hands. Taste and adjust the seasoning with salt and pepper. 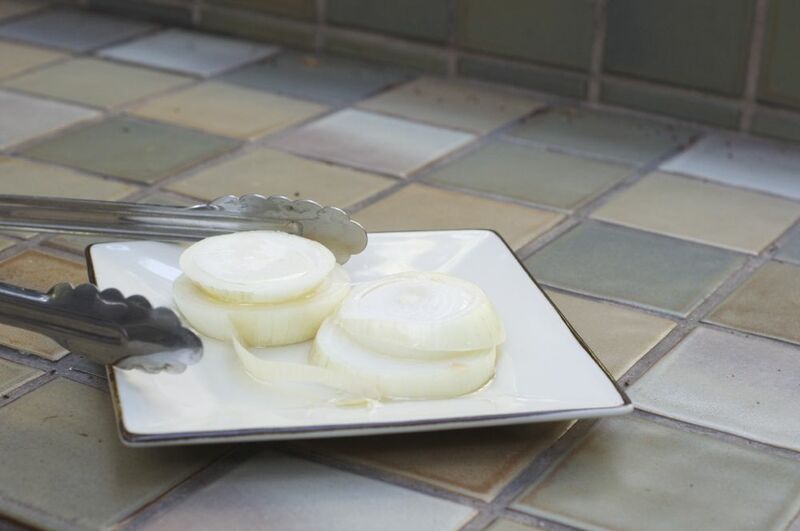 If you’re able, take the time to grill the onion for this vinaigrette. 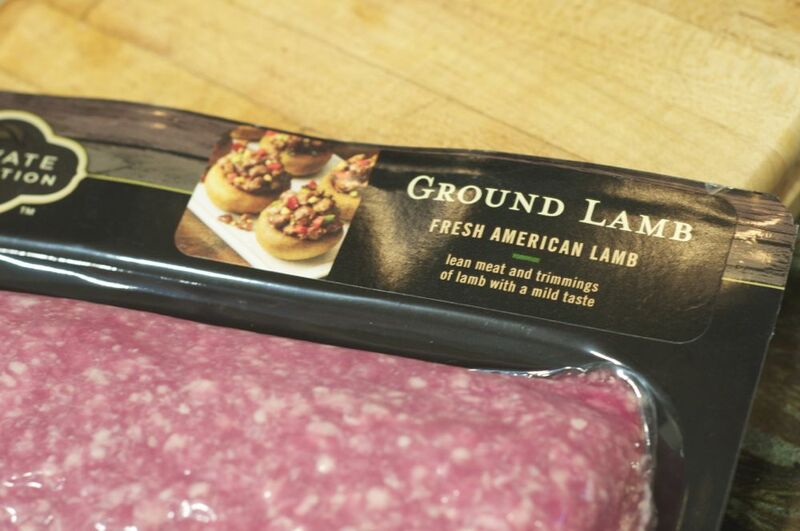 Slice into 1/2″ rings, drizzle with oil, and char on the grill until soft. 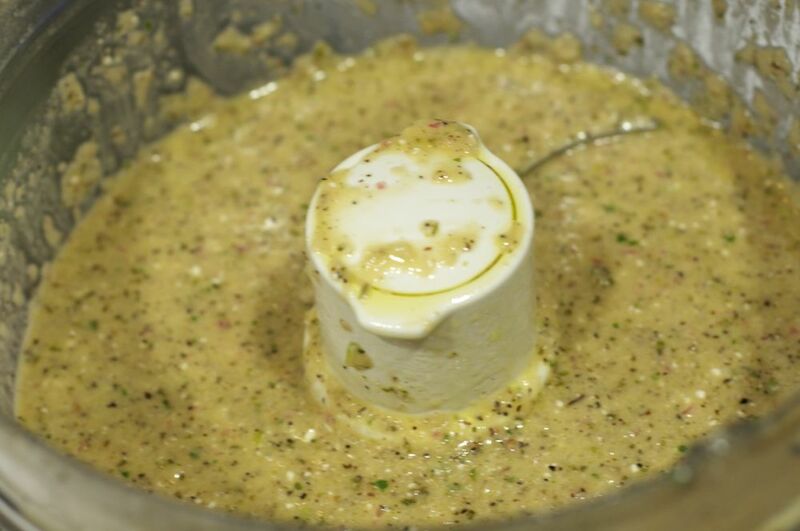 In a food processor, combine all ingredients except olive oil. With the motor running, drizzle in the olive oil until smooth. Taste, and if needed, season with more salt and pepper. 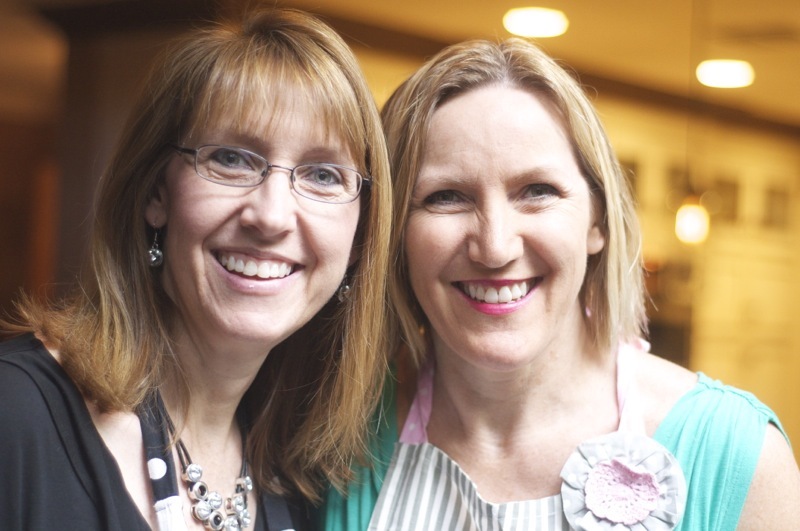 Last weekend my sister Nila came to town, and since she lives all the way in Kansas, we don’t get to see each other often enough. The weekend was filled with all things L.A. .. Getty Museum, Santa Monica Beach, happy hour at Drago Centro, The Last Book Store, but I’d have to say my favorite event was spending an evening in the kitchen together, making a Bobby Flay feast for an intimate dinner party. Now if you’ve ever perused Bobby’s Mesa Grill cookbook, you can probably understand how quickly the time flies by when preparing his dishes. And while it is true that many of his dishes do take some time to prep, it’s worth it! I simply love the fresh tastes of his contemporary Southwestern menus. So here’s what was cookin’ in my kitchen ..
2. 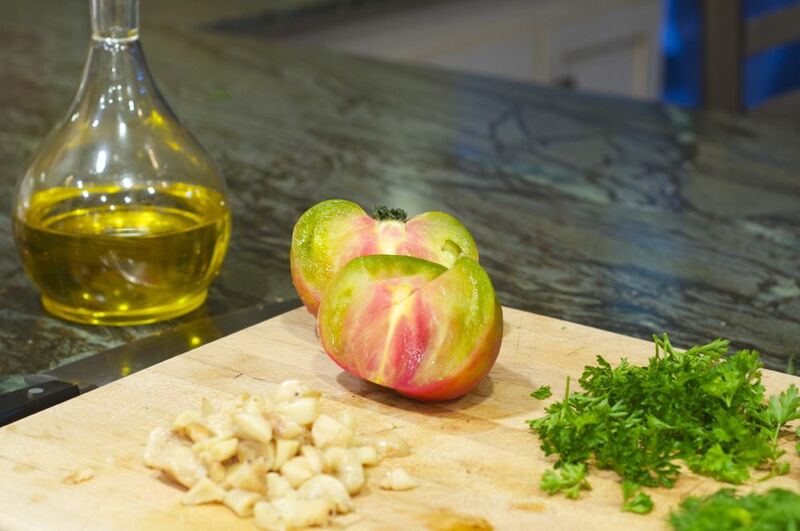 Place the frisee in a large bowl, add 1/4 cup of the vinaigrette, season with salt and pepper, and toss to coat. Place the tomatoes in a bowl, add a few tablespoons of the dressing season with salt and pepper, and toss to coat. 3. 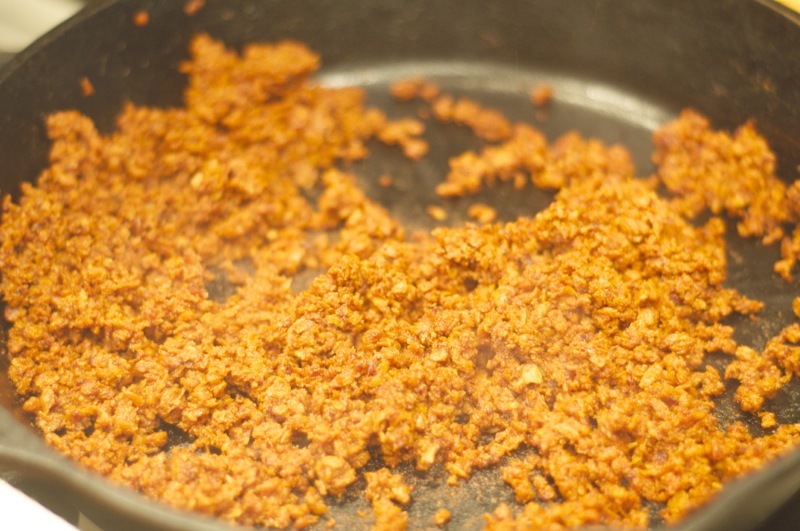 Divide the frisee among 4 large plates, arrange tomato quarters and slices of the chorizo around the perimeter of each plate. 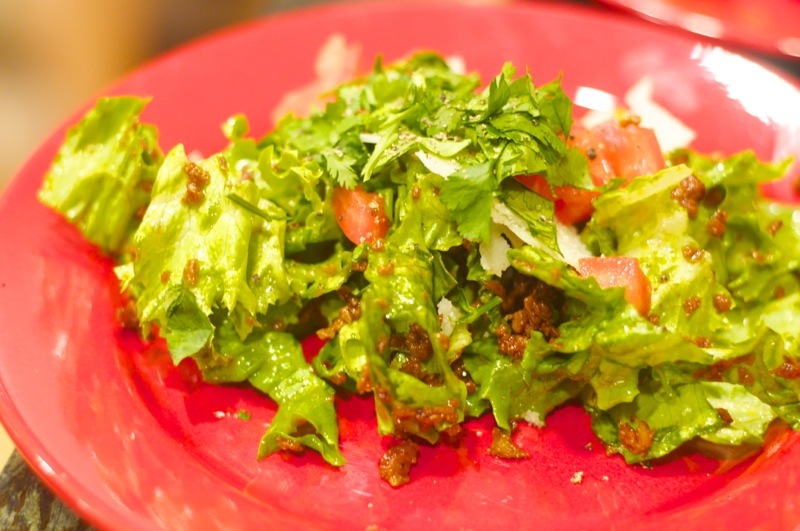 Garnish with shaved cheese and chopped cilantro, and drizzle with the remaining vinaigrette. 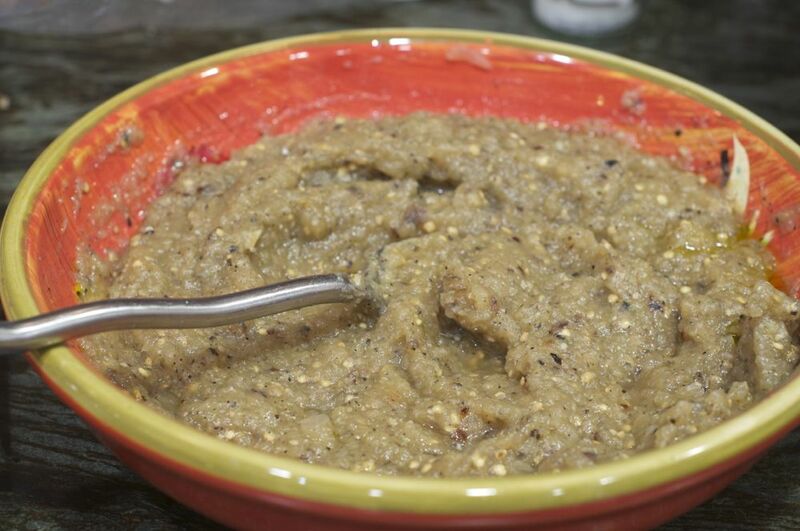 Combine the garlic, vinegar, onion, honey, lime juice, and salt and pepper to taste in a blender and blend until smooth. With the motor running, slowly add the oil and blend until emulsified. This can be made up to 1 day ahead and refrigerated. Roasting garlic: Preheat the oven to 300 degrees. Separate the cloves of a head of garlic, but do not peel. Drizzle the cloves with olive oil and season with salt and pepper. 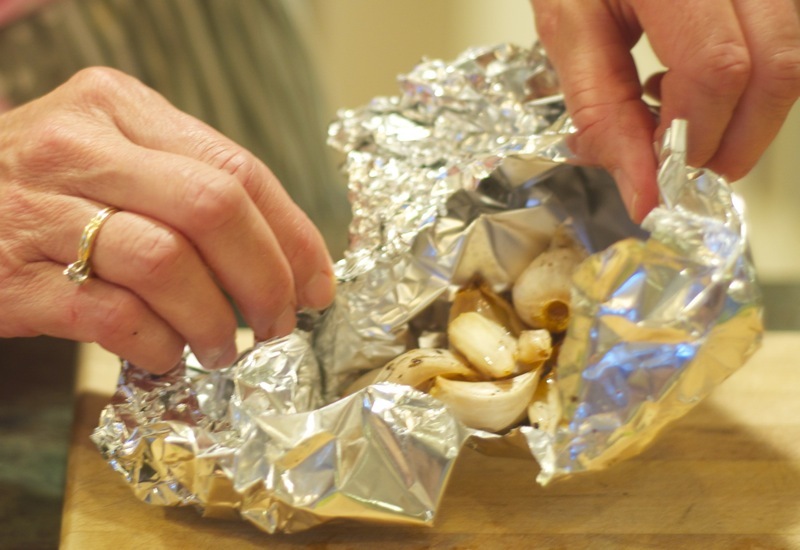 Wrap the garlic securely in aluminum foil and place on a baking sheet. Roast in the oven for 45 minutes to 1 hour, until very soft. Squeeze the pulp from the skins, discarding the skins. Roasted garlic will keep covered and stored in the refrigerator for up to 5 days. Bobby Flay says this is one of the all-time most requested recipes at Mesa Grill. 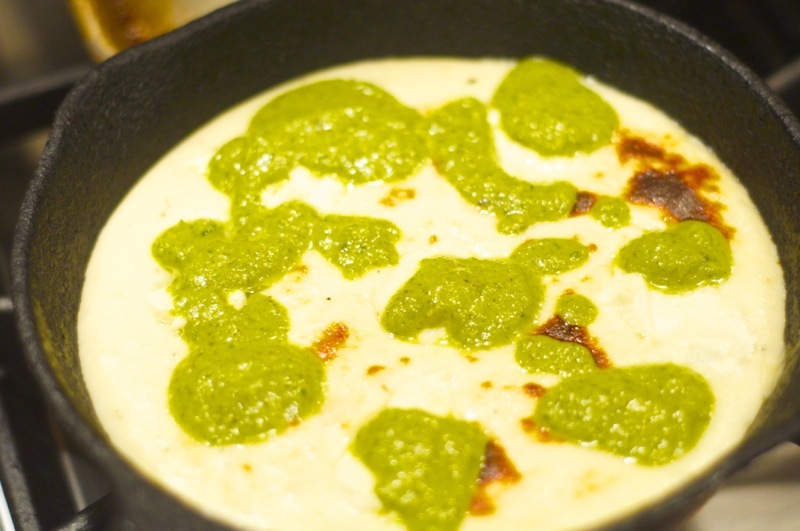 He says “what’s not to like about melted, bubbly cheese topped with a green chile vinaigrette?” It’s pretty easy to make, so give it a try! 2. Melt the butter in a medium saucepan over medium heat. Whisk in the flour and cook for 1 minute. Whisk int he milk and cook until slightly thickened. 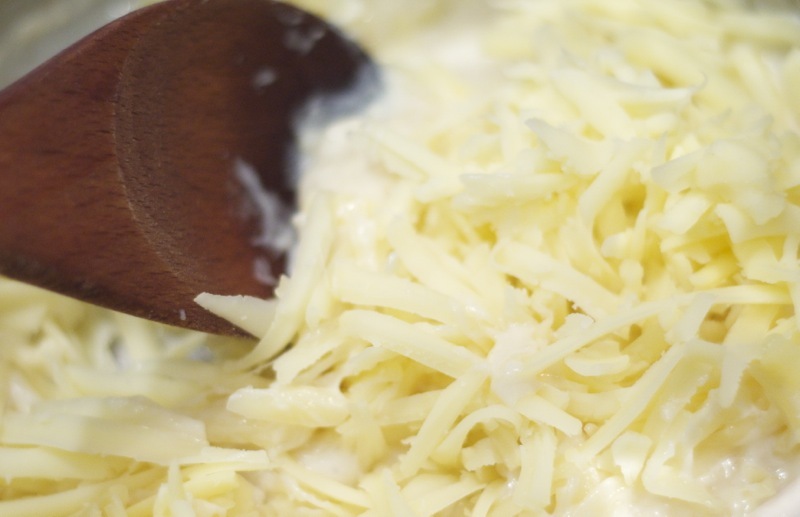 Remove from the heat and stir in the grated cheese; season with salt and pepper. 3. Scrape the mixture into an 8-inch cast-iron pan and place the slices of goat cheese over the top. Put the pan under the broiler and broil until the goat cheese is golden brown on top. 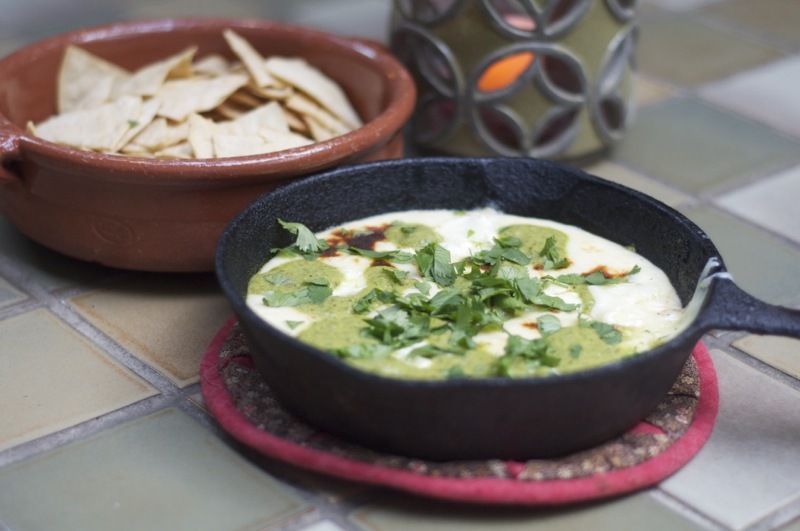 Remove from the oven, drizzle with the poblano vinaigrette or spoon it over the top, and sprinkle with the cilantro. Serve with chips for dipping. Pre-heat your broiler. Cut peppers or chiles lengthwise; remove seeds and stems. 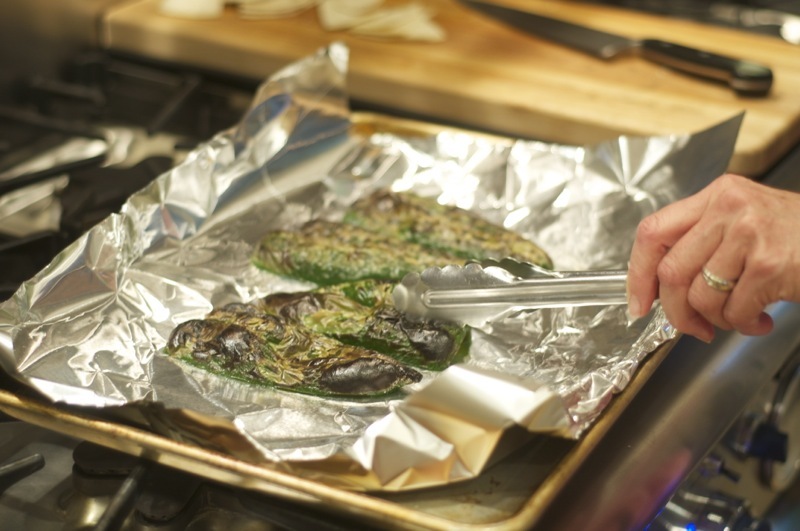 Place peppers, skin side up, on a foil-lined baking sheet. Slide into the oven and broil until charred nicely (keep a close eye on your oven – this won’t take long!). Remove from the oven and place peppers in a bowl, cover with plastic wrap, and let sit for about 15 minutes to allow the skin to loosen, then peel. 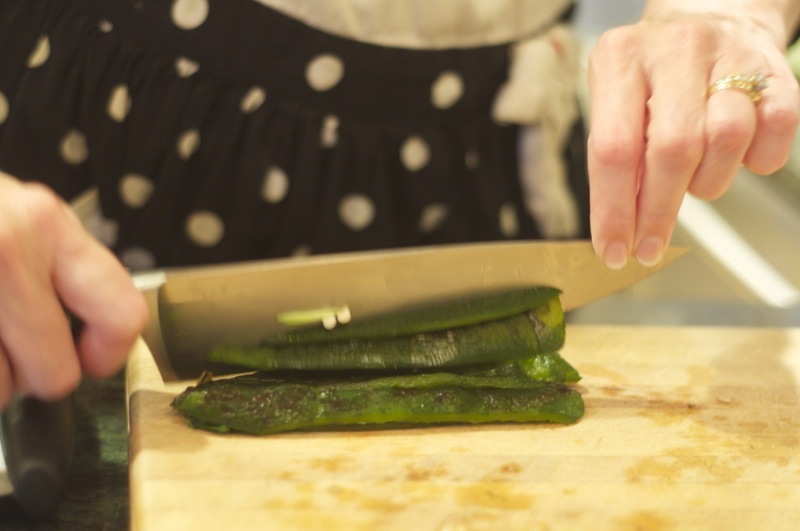 Roasted peppers and chiles can be covered and stored for up to 5 days in the refrigerator. I’m fortunate to live in a diverse city, with access to all sorts of ethnic markets. One of my favorites is Baja Ranch, just up the street. 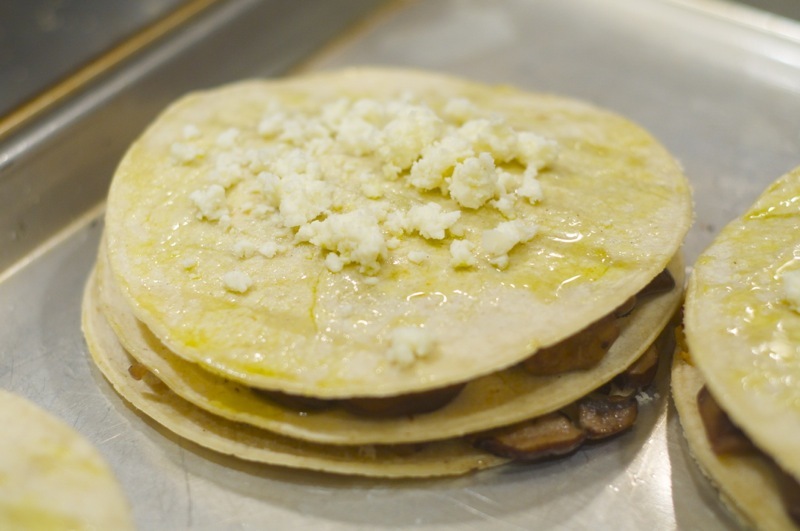 They make the BEST corn tortillas, fresh every day. 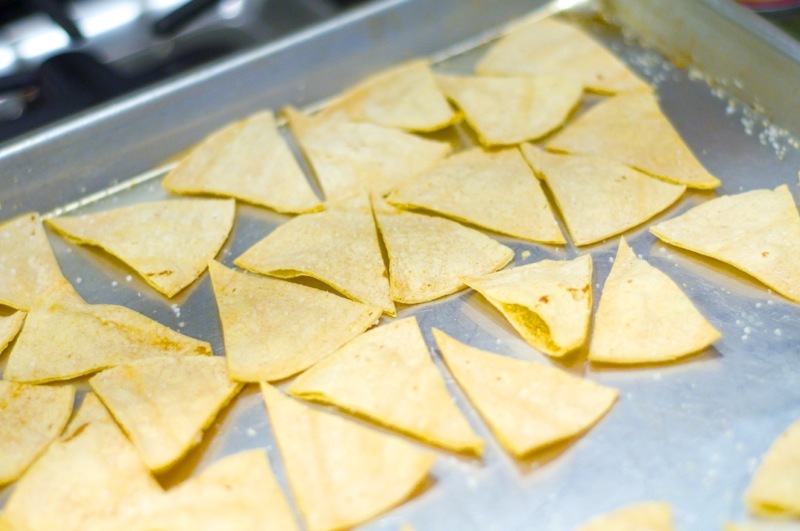 I like to make my own tortilla chips in order to cut down on the fat and sodium. Cut the tortillas into chip-sized wedges; spray a half-size cooking sheet with cooking spray, then lay the tortillas in a single layer. Spray the tops with a bit more cooking spray, then sprinkle with kosher sale. Bake in a 375 degree oven until crisp and golden, about 12-14 minutes. Not only is this dish super tasty, it’s beautiful, too! 2. Heat 2 tablespoons of the olive oil in a large saute pan over medium-high heat. Add the onion and cook until soft, 3-4 minutes. Add the garlic and cook for 30 seconds more. 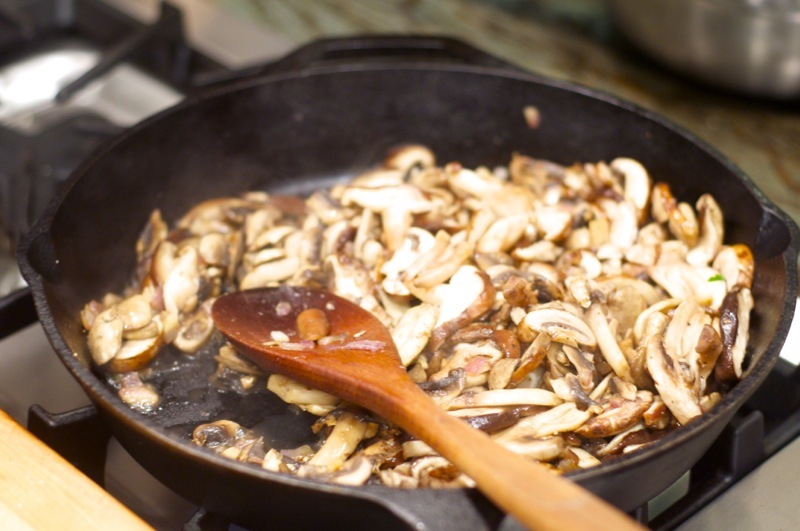 Add the mushrooms, season with salt and pepper, and cook until golden brown and all of their liquid has evaporated, 8-10 minutes. 3. Remove the anchos from their soaking liquid, reserving 1/4 cup of the liquid. Stem, seed, and finely chop and place in a bowl. Add the reserved soaking liquid and the cheese, and mix to combine. 4. Place 8 of the tortillas on a flat work surface. 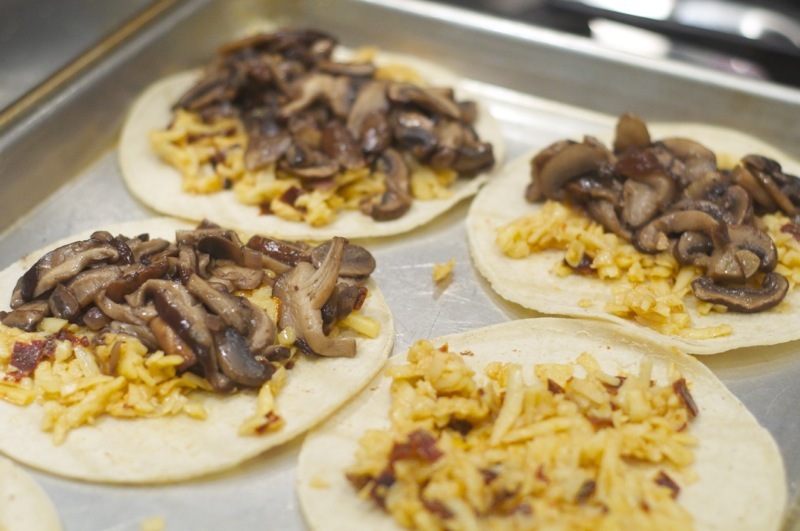 Divide the cheese mixture and mushrooms among the tortillas and season with salt and pepper. Stack the tortillas to make four 2-layer tortillas and cover each with one of the remaining tortillas. 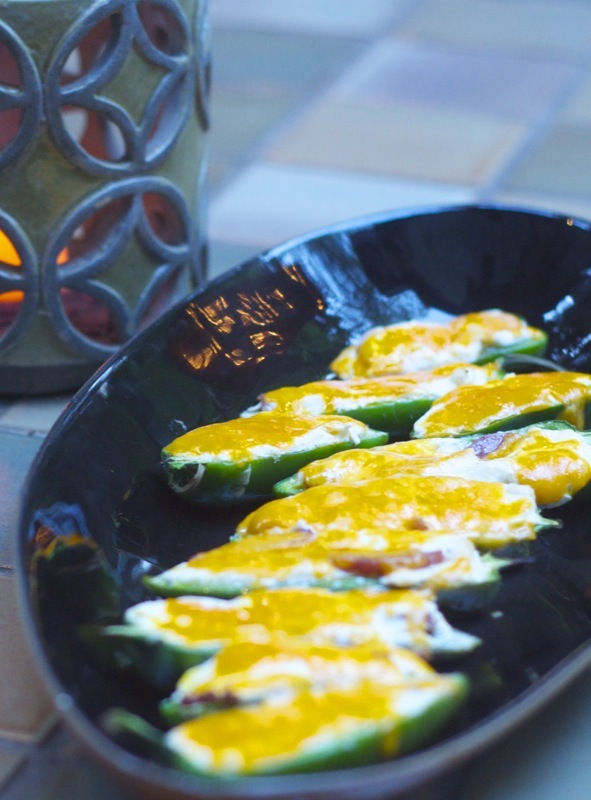 Brush the tops with the remaining 2 tablespoons oil and sprinkle with the cotija cheese. 5. Transfer to a baking sheet. Bake for 8-10 minutes, until lightly golden brown and the cheese has melted. 6. Cut into quarters and drizzle with the truffle oil. Soaking chiles: Place dried chiles in a bowl. Pour boiling water over the top to completely immerse the chiles. Let soak for about 30 minutes, or until soft. 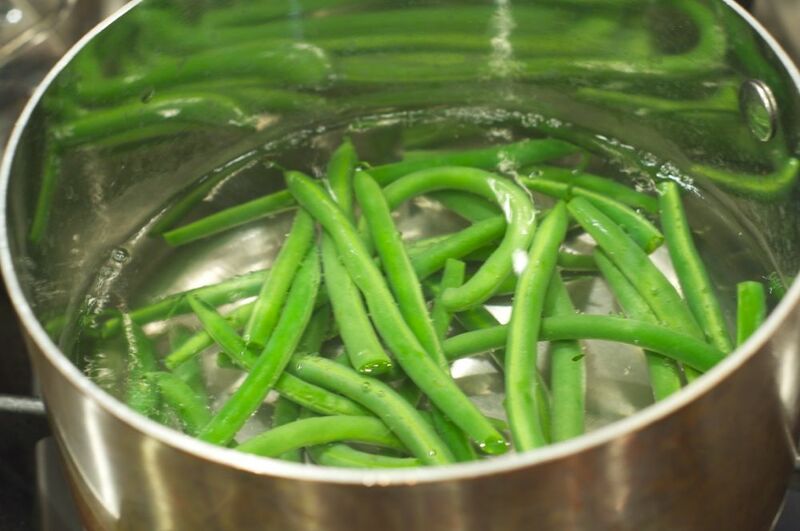 Remove the chiles from the water and remove the stems and seeds, reserving the water. 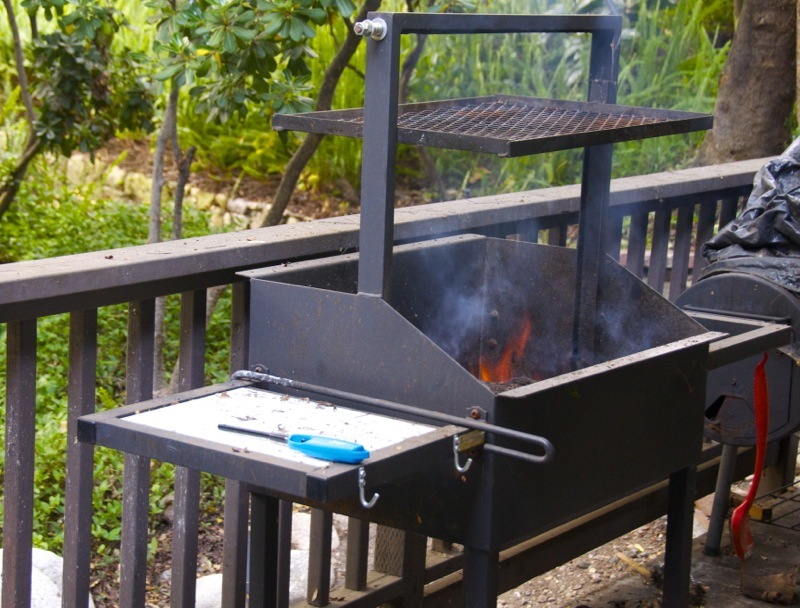 Searing over a wood fire is one of my favorite ways to prepare a steak, and last year we picked up a Santa Maria style barbeque which is the perfect tool for making a perfect steak. We rubbed our steaks with BBQ Beef Coffee Cure (recipe from Tim Byres cookbook called Smoke: New Firewood Cooking) and the hubby grilled our steaks to perfection! Byres says “I encourage rolling up your sleeves and using your hands to mix these spices – it helps to capture a feeling of nostalgia for cooking” .. and I couldn’t agree more! Mix all ingredients in a medium bowl, using your hands to break up any clumps. Do not refrigerate. Store in an airtight container, in a cool, dry place, such as your cupboard. This blog is just some stuff that popped out of my skull. Most of it is fiction, some of it is opinion. Some of it? Just mere musings of a fella who has some attention issues and who has managed to navigate life in a manner that some deem as, well, OK.